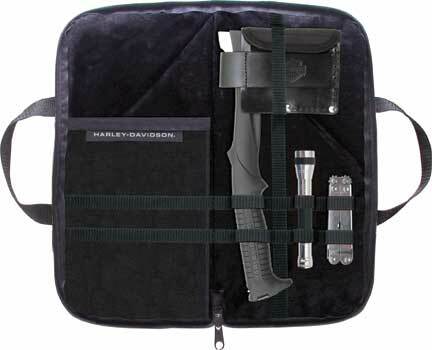 Harley Davidson Camping Kit. Includes one HD-41 Axe, one HD-29 Twelve Function MotorTool (no sheath) and a LED light. Light features five LED bulbs, two replaceable AA batteries (included) and aluminum body with black rubber grip. All store inside a reinforced nylon case. 2006. Ability Web Service, Inc.